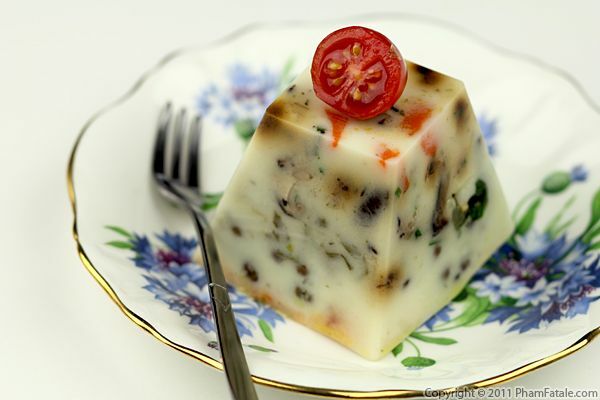 Terrine in French is a jellied dish. It's usually made of meat or seafood but today I made it exclusively vegetarian as an opportunity to experiment with the Redwood Hill Farm and Green Valley Organics products I recently received. 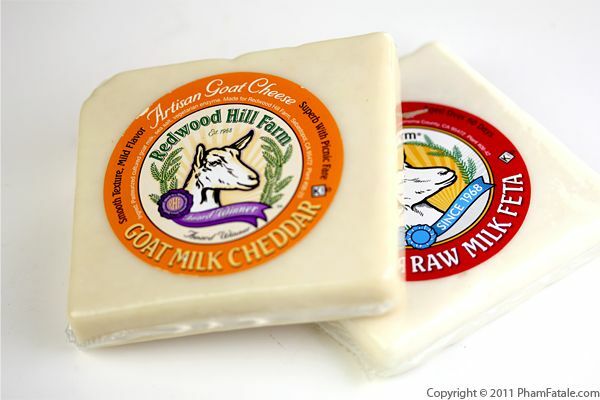 Several of the people in my family are lactose-intolerant, so the combination of goat dairy products from Redwood Hill Farm and lactose-free cow dairy products is a real blessing. But the kefir, sour cream and yogurts are not just serviceable substitutions; these are some of the best dairy products I've ever used. I created 3 layers respectively made with black beans and raw goat milk feta cheese, artichoke pesto; and sun-dried tomatoes and goat milk Cheddar cheese. I used agar agar, a seaweed substitute for gelatin, so the terrine would keep its shape together. To complete the dish, I drizzled it with tamarind chutney. Needless to say I've had a blast cooking with and tasting the products, and if you're lucky enough to win, you will too! This is the last day of our 25 Days of Giveaways. Enter and you could win a prize valued at $100 (I picked my favorites from Redwood Hill Farm's selection of artisan cheeses also available for sale online at http://www.redwoodhill.com/shop, the full line of GVO products at http://greenvalleylactosefree.com/products/ and Redwood Hill Farms yogurts, kefirs and millk). Make sure you're a fan of PhamFatale Facebook fan page, Green Valley Organics and Redwood Hill Farms or follow @Phamfatalecom and tweet about this giveaway. To make it easy, you can just copy and paste this tweet if you’d like: "$100 RHF & GVO #Giveaway from @Phamfatalecom and @gvolactosefree: http://bit.ly/sp4V7y". PS: Also, the first 100 people to submit their address and the comment "Pham Fatale" on the Green Valley Organics contact page will receive a coupon for a free cup of yogurt! Hurry to get your coupon (the offer ends on 12/31)! Ma petite poupée! (My little doll). PPS: I have one other announcement to make today and it's that my husband Lulu and I welcomed our first child into the world recently. She's a very healthy little girl and she's quite a handful. 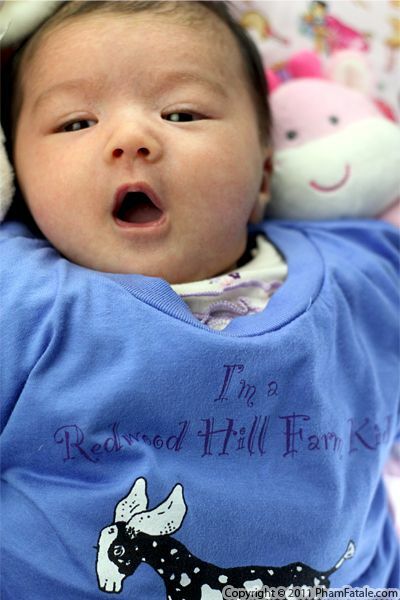 The folks at Redwood Hill Farms were so sweet to send me a tee-shirt for her to wear, and I thought I'd share the picture with you. She will definitely be a Redwood Hill Farm kid. Merry Christmas everyone! Panna cotta is probably the easiest vegetarian appetizer to prepare once you've figured out how to deal with agar agar. It’s all about the liquid to powder ratio. In case you don’t know, agar agar is a seaweed substitute for gelatin. I've created several savory and sweet panna cottas in the past using it. 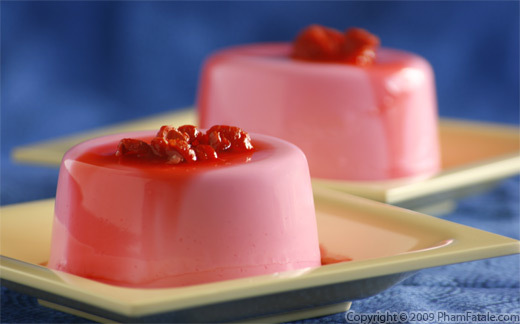 Like other gelatin-based products, panna cotta can be be formed in any shape you want. I shaped the ones I made today in verrine glasses. I layered this panna cotta with red hummus, broccoli florets, baby spinach leaves, morel mushrooms and sugar plum tomatoes. Assembling them is very simple and they can be prepared in advance. Serve this panna cotta with a large salad and a baguette and you’ve got yourself a delicious, light meal. 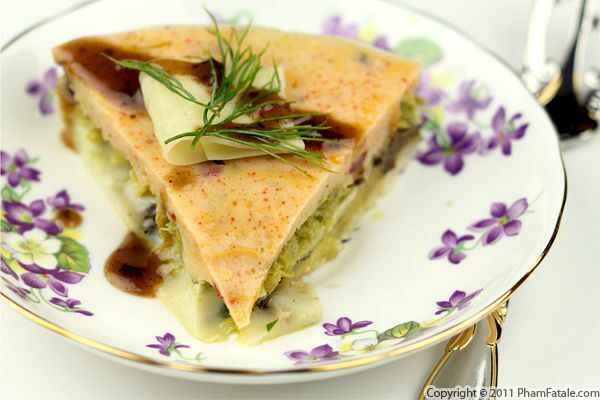 Terrine de légumes is another attempt on my part to share one of my favorite French "meat" dishes with my husband Lulu, who's a vegetarian. 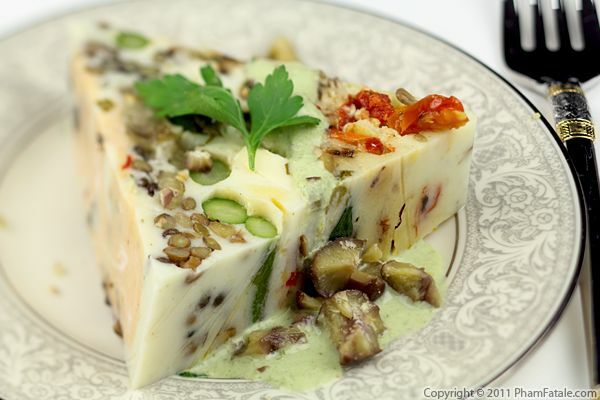 Pâté en terrine, in French, is a jellied meatloaf, so instead, I created a multi-layered vegetable terrine made of black lentils (for protein), grilled asparagus, crimini mushrooms, mozzarella and sun-dried tomatoes. 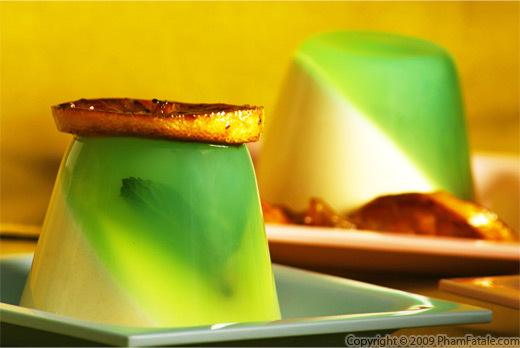 The jellied part of the terrine is replaced by a mixture of goat milk and agar agar. I dressed the terrine with spicy parsley vinaigrette and decorated it with roasted chestnuts. You won't miss the meat! I think I'm getting addicted to panna cottas. This dish is so easy to make. I still have a bunch of Meyer lemons from my garden and my herb box is already full of mint. As I was pulling the weeds out while gardening, it occurred to me that I could make a Meyer lemon panna cotta with a mint jelly. My husband loved it. The lemon and mint go suprisingly well together, and the contrast in textures between the jelly and panna cotta brings another dimension to the dessert. Panna cotta is a very easy recipe. It is as versatile as crème brulée or pot de crème. The base is just a dairy with a gelling agent like agar or gelatin. You can create your own signature version by adding your own twist to it. You can use different flavors like rose, strawberry, pandan, peppermint, mocha or any other savory flavor that you can imagine. It is a true culinary chameleon.